Antibody Drug Conjugates (ADCs) represent a distinct class of therapeutics designed to treat diseases by targeting only tissues bearing a distinct marker or receptor that is overexpressed on the targeted cell. So far, ADCs have been predominantly used to specifically target anti-tumor toxins to cancer cells. ADCs comprise antibodies equipped with cytotoxic drugs (payloads), bound together by linkers, which release the payloads only within cells expressing the targeted receptor. The FDA approval of first generation ADCs such as Kadcyla®, Adcetris® and Besponsa® and the recent re-approval of Mylotarg® has demonstrated the value of these new drug modalities for treating advanced cancer. ADCs already represent a multi-billion dollar global market. However, it is also evident that both ‘on’ and ‘off’ target toxicities remain a feature of ADCs, restricting the delivery of optimal amounts of toxin payloads to the tumor. As such, we believe that significant opportunities exist for us to improve on these agents and other candidates in development. ADCs, Small Molecule Drug Conjugates (SMDCs) and our Tunable Drug Conjugates (TDCs) all use three basic components. A ligand designed to recognize the cell surface protein (which is often a receptor for a naturally occurring ligand) that is being targeted. A drug conjugation chemistry component (or linker) that is designed to be cleavable (usually within the target cell), thereby releasing the third component, the payload. The payload is a therapeutic moiety (typically a cytotoxic agent) that is designed to kill the targeted cancer cell. ADCs are the leading class of drug conjugate therapeutics and they use antibodies directed against the target cell surface protein as the ligand. After receptor binding, the ADC is internalized into the cancer cell (by a process call “endocytosis”) and processed through a specific compartment of the cell interior called an endosome to typically end up being cleaved in another compartment of the cell called the lysosome. The goal is that the linker will be cleaved inside the cell and the payload released in order to kill the cancer cell. A number of factors can impact the amount of toxin that can be delivered to the cancer cell including the number of receptors on the cancer cell surface, the rate of internalization and re-cycling of the receptor-ligand complex and the number of payload molecules connected to the ligand. All the multiple elements that make up an optimal drug conjugate require tuning in order to achieve a favorable Therapeutic Index (a measure of the balance of anticancer activity and the toxic side-effects suffered by the patient). If the linker is too stable under the conditions inside the cell, not enough payload will be released quickly enough to kill the cell (and, in some cases, the entire complex can actually be “recycled” to the cell surface). Conversely, if the linker is not stable enough under the normal physiological conditions throughout the body, it will cleave and release the toxin payload causing harmful toxicity to normal cells. This is also influenced by the time it takes to clear the drug conjugate from the systemic circulation. As such, the longer the drug conjugate is in the circulation the more important linker stability is in order to minimize cleavage and release of payload systemically. Another challenge is the uniformity of the expression of the targeted receptor or other cell surface protein in the various tumor lesions present in advanced metastatic cancer. It is now well understood that as a patient’s cancer progresses and metastasizes, the expression of targeted receptors both within a single lesion and between lesions can vary (a phenomenon termed “heterogeneity”). Within tumors treated with ADCs, payloads that can permeate between cells after linker cleavage can migrate to adjacent cells with low target receptor expression and partially mitigate the effects of heterogeneity in what is referred to as a ‘bystander’ effect. Our SiLinkers can be designed to cleave in the slightly acidic conditions found in the necrotic core of larger tumor masses, which may allow us to markedly impact heterogeneity with what we refer to as an ‘enhanced bystander effect’. The additional ability to release payload selectively within the tumor itself – while still outside the cancer cell – could be an additional advantage of the TDC platform. In summary, the development of an optimal drug conjugate therapeutic demands the effective balancing of all these elements: an ideal ligand that binds receptors or cell surface proteins that are abundantly present on cancer cells but much less so on normal tissues; multiple payload molecules to enhance the overall toxicity to the cancer cell and a linker that helps maximize the concentration of payload achieved in the targeted cell and – when matched to the rate of clearance of the drug conjugate – is sufficiently stable in the patient’s body. BlinkBio’s Tunable Drug Conjugates (TDCs) ) are based on the concept that the rapid and uniform release of toxin payloads inside tumors, coupled to the rapid systemic clearance of the parent TDC after dosing, will improve Therapeutic Index. Our SiLinker and payload cassette technology allows rapid & uniform release of payloads inside targeted cells and in the acidic microenvironments of solid tumors in order to drive high payload concentrations within tumor cells. Our intention is to overwhelm cellular resistance mechanisms and induce rapid killing of the cancer cells. The use of Small Molecule (SM) or antibody fragment ligands for targeting can allow for better tumor penetration compared to traditional ADCs. The preferential use of Conditionally Active Payloads (CAPs), which have reduced toxicity against normal cells due to the poor permeability of these payloads at physiological pH, but exhibit efficient permeation of cell membranes at the acidic pH’s that cause SiLinker cleavage in the endosome and in the acidic tumor microenvironment, should help to reduce toxicity. Our TDCs are designed to be cleared from the body quickly which should further improve the Therapeutic Index (T.I.) and allow patient specific schedule adjustments to help manage on and off target toxicities. We have designed and developed a toolbox comprising a selected set of Spacers; Payload Cassette (PC) Adaptors; SiLinkers and CAPs for modular assembly of TDCs. Our spacers and adaptors are designed to modulate the physicochemical properties of the final TDC. The choice of SiLinker is dictated by the characteristics of the receptor targeted by the TDC and the desired payload release profile. For payloads, we believe that CAPs such as MMAF, SN38 and TSI inhibitors are preferred, however we can modify and incorporate a variety of traditional drug conjugate payloads such as Auristatin F, MMAE and the maytansinoids. We currently employ both small molecule and antibody fragment ligands and our toolbox enables the rapid modular assembly of families of TDCs allowing accelerated lead profiling. 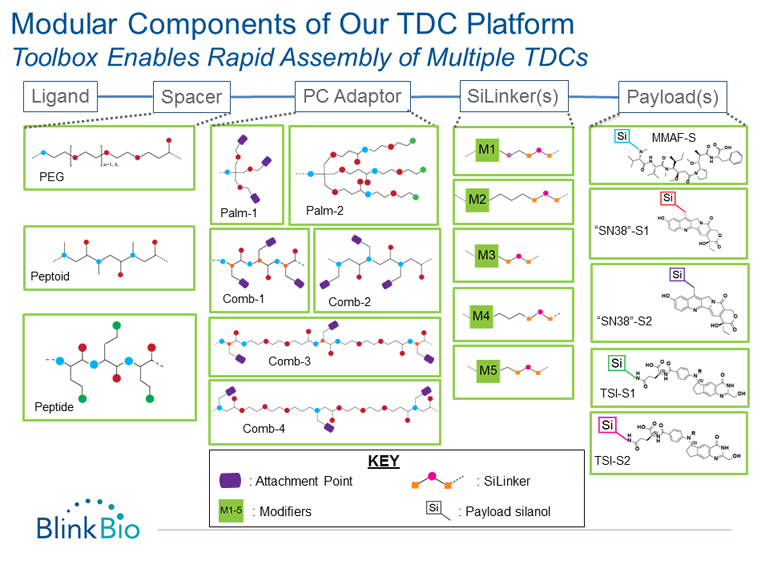 This approach facilitates the selection of the optimal ligand, spacer, adaptor and payload components of the final TDC. We believe that our technology has unique characteristics that differentiate it from other drug conjugate technologies. Our TDCs represent an holistic re-design of the necessary components of a Drug Conjugate therapeutic with an aligned set of properties intended to provide a differentiated rapid payload release/rapid systemic clearance approach that we believe can provide a compelling addition to existing drug conjugate technologies. The tunable pharmacokinetic profile of our TDCs allows for systemic clearance in hours, as compared to days to weeks for traditional ADCs which enables the clinical management of adverse effects through dose and schedule adjustments. Conditionally Active Payloads with pH dependent properties that align well with the SiLinkers can further increase Therapeutic Index.